- The Doberman Pinscher - also known as Dobermann spelled with two n's at the end, "Dobie", "Doby" or "Dobe". This dog breed originated in Germany in the 19th century and is thought the developer was called Louis Doberman a tax collector from Apolda in Germany. This dog is medium sized, compactly built, energetic and muscular, intelligent and elegant, often trained to be guard or watch dogs. They have unfortunately gained a bad reputation about their temperament, but with a good owner they will become excellent family dogs and even get along with cats. This dog breed is smooth haired, black, red, blue and fawn with rust markings well defined. They are strong-willed, quick learners and highly trainable. Plenty of mental stimulation and physical exercise will be required. 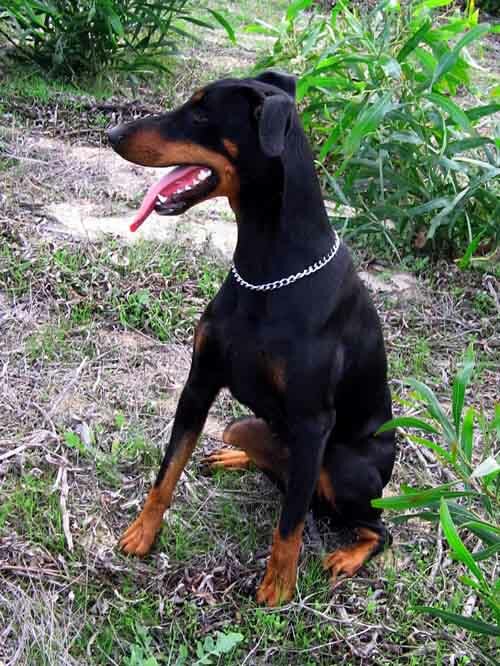 - Click here to know even more about the Doberman Pinscher Dog Breed.